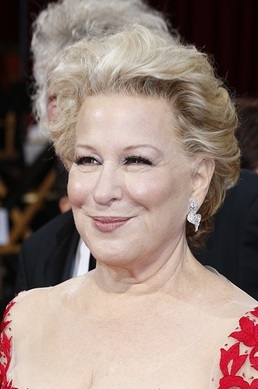 Bette Midler is an American singer, songwriter, actress, comedian, and producer. Bette is the daughter of Ruth (Schindel) and Fred Midler. She was born and raised in Honolulu, Hawaii, to parents originally from New Jersey. Her family is Jewish (from Russia, Poland, Austria-Hungary, and Lithuania). Bette is married to artist Martin von Haselberg, with whom she has a daughter, actress Sophie von Haselberg. Bette’s paternal grandfather was Ruben/Reuben Midler. Ruben was a Russian Jewish immigrant. Bette’s paternal grandmother was Minnie Friedman/Fortz (who was evidently the daughter of Mayer Fortz and Feigel Cohen). Minnie was a Jewish emigrant from Poland or Lithuania. Bette’s maternal grandfather was Israel D. Schindel. Israel was a Jewish emigrant from Austria-Hungary. Bette’s maternal grandmother was Fannie Goldberger. Fannie was a Jewish emigrant from Poland. cool lady but can we say lady ?